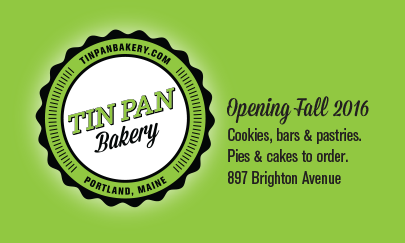 When Elise Richer decided it was time to open a new retail bakery in Portland, we were thrilled to help her with the branding. We had worked with Elise on her previous, home-based bakery: Cream & Sugar so we were familiar with her overall approach to baking but like her, were eager to do something new and fresh with Tin Pan Bakery. We started with branding research, to help find her unique fit in the market, including competitor reviews, and distinguishing benefits and attributes. Then we created her logo, business cards, menu cards as well as consulting on the signage and design of the shop itself.